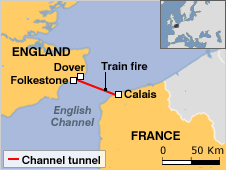 On the 7th anniversary of the 9/11 attacks, a terrible fire began ‘accidentally’ in the 30-mile long Channel Tunnel connecting England and France. The fire raged for many hours, apparently destroying 6 carriages and a locomotive, with temperatures in excess of 1000 degrees Celsius. About 6 people were harmed by smoke inhalation, otherwise the escape procedures in the tunnel went well. However, the blaze took 300 firefighters to put out, working short shifts due to the intensity of the heat wihtin the tunnel. No one knows the cause of the blaze. Yet it has been firmly described as ‘accidental’. But, how do they know for sure that it was accidental? The Channel Tunnel is surely an obvious target for a terrorist attack, and it is surely possible that the fire was the by-product of an unsuccessful attempt at an explosive detonation. Such a scenario would be frightening indeed, at any time of the year. But the date of this event should send a shiver down all of our bones, if it turns out that foul play was involved. ~ by andylloyd on September 16, 2008. “Police quiz village terror suspect. Detectives are questioning a man under the Terrorism Act after his arrest in a quiet country village. The suspect, who has not been named, was detained in Hawkinge, near Folkestone, Kent, at about 8.45am on Monday. The man is being questioned at a police station in the county on suspicion of being engaged in the commission, preparation or instigation of an act of terrorism, a Kent Police spokesman said. There is no suggestion that the arrest is linked to last week’s Channel Tunnel fire or recent investigations in the north of England into an alleged threat to kill Gordon Brown. Read this article and notice how the the rather notable fact that it occured on 9/11 is completely unmentioned. And they give no explanation for the fire, saying it could have been a truck with flammables, etc.. Buring at 1800 degress? Come one. Sounds kind of suspicious to me..